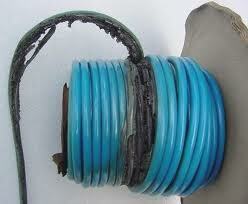 What aspect using a coiled extension cord makes it more dangerous than using an unrolled power cord. 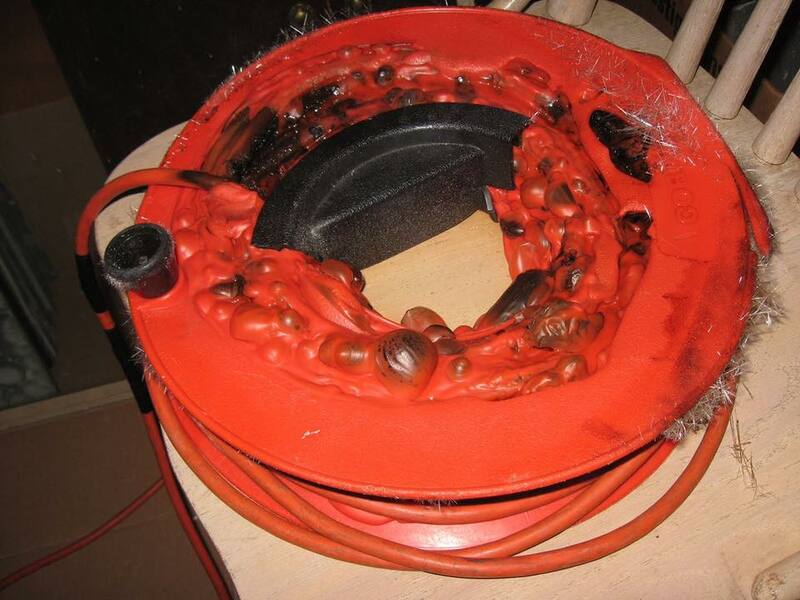 Many fire safety websites reference that an extension cord should not be used while coiled. Is this due to the cord acting as an air core inductor (I can't really see why this should cause fires). If this is the case, if every second loop is in the opposite direction is it safe. My theory is that if the cord is getting heated from high current draw, when coiled all of this heat is in a much more condensed location, causing a greater temperature rise than if the cable was unrolled. Is it dangerous, if so what is the cause. Am I missing anything, do parameters like loop size, loop direction etc make any appreciable difference. The normal cable ratings assume that the wire can adequately disperse heat generated in the cable due to the current flowing. If you coil it up and use close to the maximum rating then it stands a good chance of melting the plastic insulation and then causing a short. Last week (1st week in Jan 2017) we almost had a fire from a coiled extension cable. It was connected to an electric urn that does draw high power, and the only reason it did NOT start a fire was the circuit breaker tripped in time. I have kept a segment of the cable in question were it melted several loops together before the wires touched inside the mess. Current flowing in a cable generates heat. This causes the temperature of the conductors to rise until the heat lost balances the heat generated. 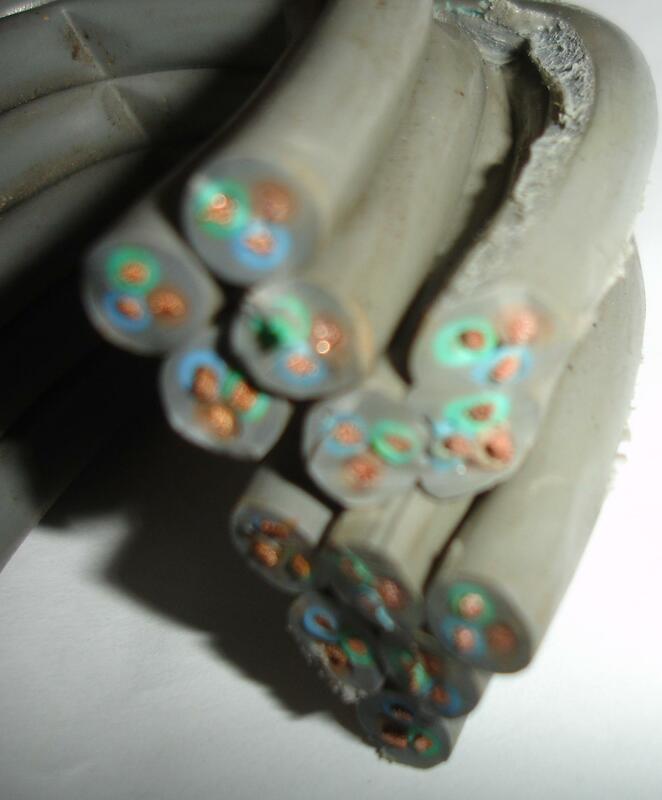 If the temperature gets too high the insulation on the cable softens and eventually melts. When you pack lots of cables that are all carrying current (whether multiple seperate cables or multiple loops of the same cable) together heat dissipation suffers resulting in a higher temperature at a given current. Reels are particulally bad because they tightly pack together a large number of passes of the cable. Excess cable in a loose jumble on the ground is far less likely to overheat than excess cable wound tightly on a reel. You get away with it most of the time because most of the loads people plug into extension leads are small and/or intermittent. From time to time though the right combination of circumstances come together and melts one. Figure 1. An inductive coil. Figure 2. Cancellation. Unless you wired your equipment with single wires it would not be possible to create an air-cored inductor as shown in Figure 1. Because your cables contain the feed and return current in very close proximity the inductance caused by the current to the load is exactly cancelled out by the current returning from the load. The danger is that if they are carrying significant current (for the gauge of wire) they will get warm or hot. This may cause insulation breakdown or even fire. The technical answer to why coiled electrical cords melt is based on heat transfer methods; radiation, conduction, convection. All three heat transfer methods play a role, but especially radiation. Air has less ability to convect heat away when coiled. Conduction works by direct contact, which is elevated by coils touching. Radiation especially elevates heat transfer when two closely opposing surfaces both radiate heat towards one another, creating a phenomenon called 'radiation feedback.' Radiating heat bouncing back and forth between the two closely opposing surfaces raises the temperature on a logarithmic scale rather than linear scale. By understanding electricity generates heat, dissipating the heat through proper heat transfer methods is safe, substantially increasing the heat through heat transfer methods will exceed the insulating materials capacity to absorb heat, possibly reaching fire ignition temperature, is not safe. Not the answer you're looking for? Browse other questions tagged safety cables heat or ask your own question. What's the rationale behind these warnings about extension cords? How dangerous is a bare wire? Max length of extension cord for a 5kW load on 240? Is it true that when extending a high watt appliance with a extension cord I should use a thicker (higher AMP) cable than the cable of the appliance? Electric current in extension cord when device turned off (and how much power)? When can free-floating electrical contacts become dangerous (e.g., start a fire)? How could using an ungrounded appliance with a grounded extension cord be a fire hazard? Why is touching the live wire of a socket dangerous inside an apartment few stories up? Is it Safe to Plug an Extension Cord Into a Power Strip?